A few months back I wrote some practical tips for recording video interviews, in Recording Video Interviews: Three Non-Obvious Tips That Make a Difference. Now it is the turn of audio podcast recording with five best practices that will help you to record audio podcasts quickly and easily yet produce a professional result. 1. Create your podcasts on your laptop using a lapel microphone and Audacity editing software. This setup is effective, inexpensive and portable so you can record anywhere. 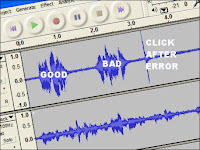 Adobe's Audition editing software is also good, but Audacity is free and more than good enough.